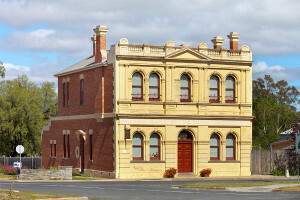 Our Goldfields Italianate former Bank building is in Avoca, the heart of the Pyrenees wine growing area. Our accommodation has two large bedrooms with en-suite facilities, TVs' and tea and coffee making. Separate sitting room for guests and continental breakfast served in the dining room or outside in the garden weather permitting.